The excitement around today’s running of the Folds of Honor QuickTrip 500 is exceptionally high. New NASCAR rules designed to make races more competitive begin with changes put into place for Atlanta. Driver’s, crew chiefs, media, and fans are not quite sure what to expect. Lately, Monster Energy NASCAR Cup Series races at Atlanta Motor Speedway have been single file circles of the track. Little passing, with the exception of during restarts. The competition package now in place is designed to create that side-by-side excitement the fans love. Will it happen? Let’s hope so. Many of the mile and a half tracks on the circuit suffer from the same racing conditions. Complete integration of the rules will not occur until next week at Las Vegas. However, enough of the package is in place to have reduced speeds five to seven miles per hour since last year. Increased downforce will allow for multi-groove racing, the rest is up to the drivers. The Folds of Honor 500 consists of 325 laps. Stages are 85/85/155 laps necessitating a pit stop during every Stage. Tires are a factor at Atlanta. The racing surface is very coarse and speed falloff from worn tires is significant. Pit strategy regarding tire changes will be interesting to watch and may determine the winner. 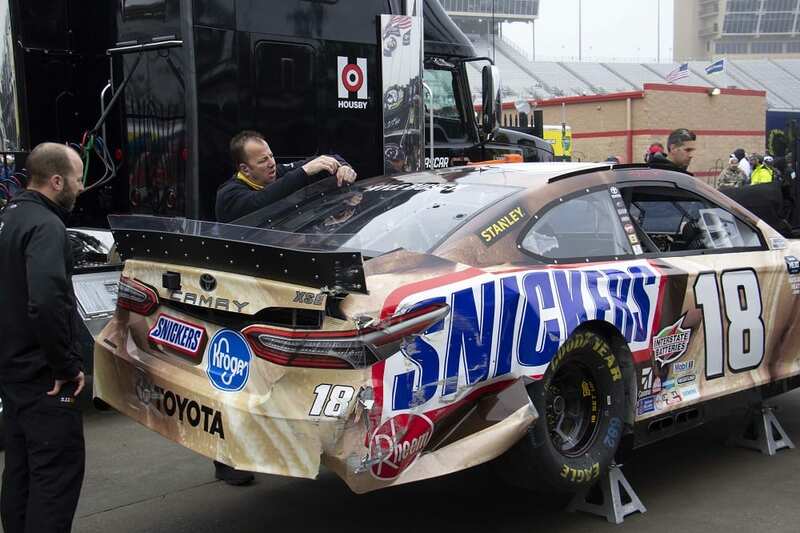 Kyle Busch(18) wrecked his car during the final practice session Saturday. He will start in a back-up car at the rear of the field. Aric Almirola(10) has his Ford Mustang sitting on the pole. The Ford Performance Mustangs of Ricky Stenhouse Jr.(17) and Almirola’s teammate Clint Bowyer(14) start 2nd and 3rd. Daniel Suarez starts 5th as the Blue Oval Pony continues to show impressive speed. 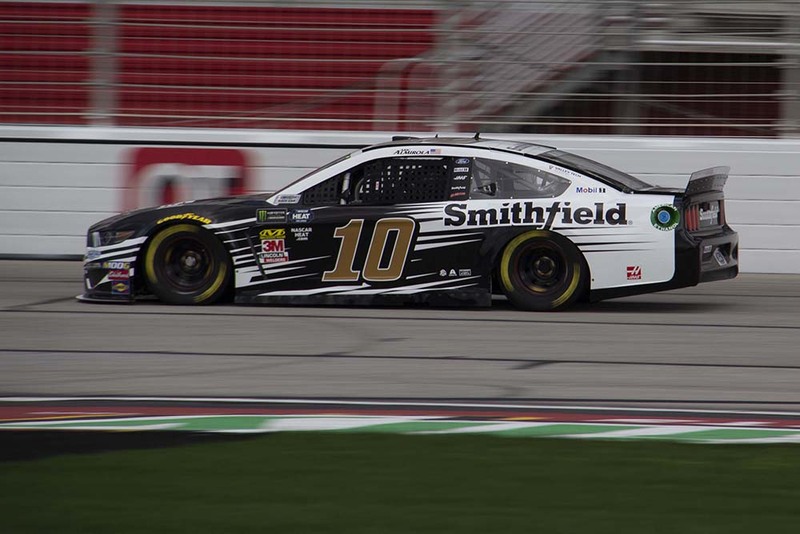 Almirola drove to the lead quickly and began to pull away from the pack. Drivers traded positions through the field, even running three and four wide in the corners. Cars making runs and passing occurred throughout the entire circuit of cars. Drivers seemed hesitant to run side-by-side for multiple laps. However, early in the race, there was no need to push it. Conserving tires was more important. NASCAR scheduled a competition caution for Lap 35 due to rains overnight at Atlanta. Kyle Busch worked his way from the rear at the start to 12th place by the time the caution flew. The race off pit road went to Kyle Larson(42), Almirola was 2nd, Kevin Harvick(4) 3rd, Denny Hamlin(11) 4th, and Kyle Busch 5th. 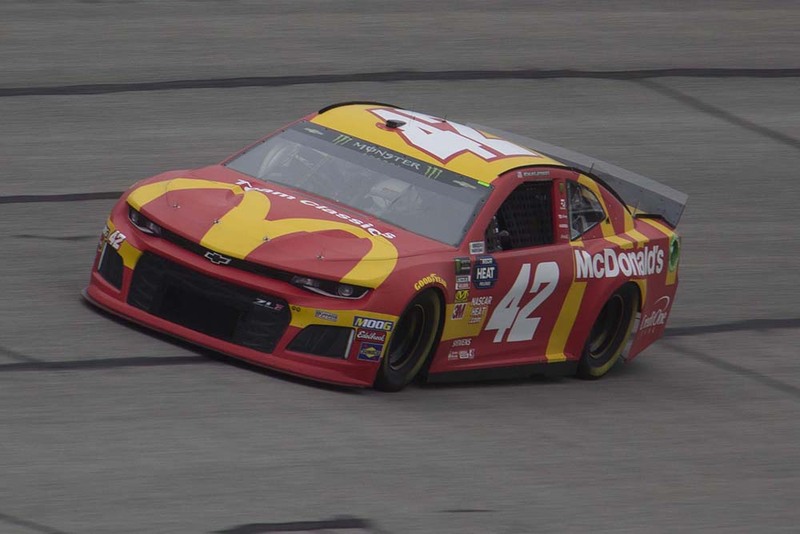 Kyle Larson(42) maintained the lead on the restart. Clean air seems to be a big factor and Larson slowly pulled away from Almirola. Taking the Stage 1 win and it’s 10 bonus points. Almirola was too fast entering pit road at the end of Stage 1 and will have to restart from the rear of the field. Harvick, first off pit road, took the lead as the green flag dropped on the start of Stage 2. Drivers battled three and four wide behind him as restarts were shaping up to be very competitive. As positions sorted out, Larson ran 2nd, Martin Truex Jr.(19) 3rd, Ryan Blaney(12) 4th, and Kurt Busch(1) sat in 5th. Larson, running the high line, was able to track down and pass Harvick who stayed tight to the bottom yellow line. During Stage 2 drivers seemed to spread out and put in laps. Still passing occurred as Almirola drove from the rear and Joey Logano(22) moved up after losing time on pit road pinned in his stall by other cars. The first green flag pit stops of the day began on Lap 126. After cycling through Larson resumed the lead with Harvick right behind. With 20 laps to go in Stage 2, Larson was about to lap Matthew DiBenedetto(95). Matt, not wanting to go a lap down fought off the challenge for several laps. This allowed Harvick to close up onto Larson’s bumper. The two battled for several laps for the Stage win. Harvick regained the lead on Lap 162 as Larson got loose coming out of Turn 4. Tire wear proving to be a real factor to cars running the top groove. Harvick held on for the Stage win. Pole sitter Aric Almirola worked his way back to 14th after the pit road speeding penalty. Harvick and Larson again restart on the front row. This time Larson pulls out front. Truex in 2nd, Kyle Bush in 3rd and Harvick in 4th as the front of the field forms up. No cautions for on-track incidents has narrowed the field to 22 cars on the lead lap due to extended green flag runs. If the race remains accident-free green flag pit stops and tire wear are likely to determine the winner. Pit stops started on Lap 219. Then Kyle Busch scraped the wall and flattened the right rear tire. Smoke from behind his car brought out the caution in the middle of green flag pit stops. Quick pit work kept Busch on the lead lap. During yellow flag stops, Larson was too fast on pit road and will move from the front to the rear of the field. Harvick restarted with the lead, but it did not take long for Blaney to make the pass for the top spot. Truex moved to 2nd, Logano took 3rd, as Harvick dropped to 4th complaining of a tight race car. 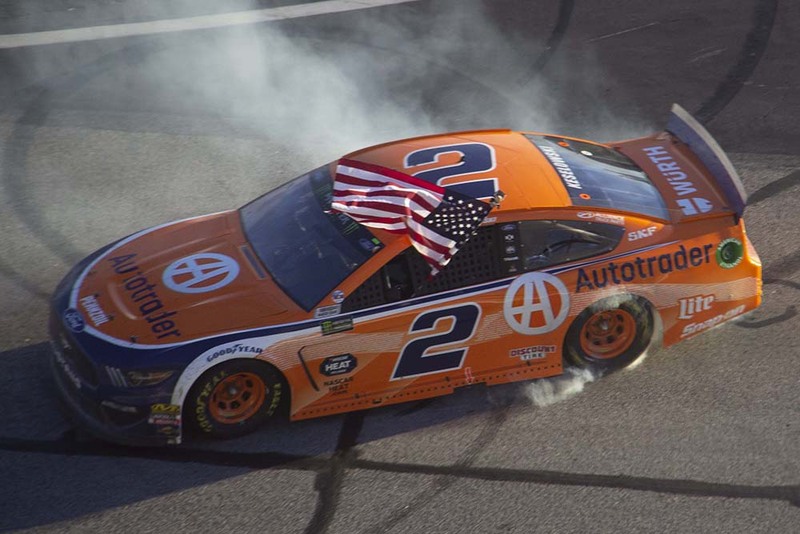 Brad Keselowski(2) moved past Harvick’s ill-handling race car to take the 4th spot. Giving Team Penske 1st, 3rd, and 4th with 65 laps to go. Keselowski spent Saturday in the motorhome suffering from stomach flu. Austin Cindric drove Brad’s car in the Saturday practice session so the crew could tune it for the race. Cindric was standing by if Keselowski needed to exit the car. Brad insisted he could tough it out. Green flag pit stops commenced with 55 to go. Ryan Preece(47) exiting his pit stall looked down at his tach to regulate his pit road speed and did not see BJ McLeod(52). Preece plowed into the 52 car as McLeod was pitting, damaging Preece’s car. Exiting the pits Preece dropped fluid on the track and brought out the yellow flag. 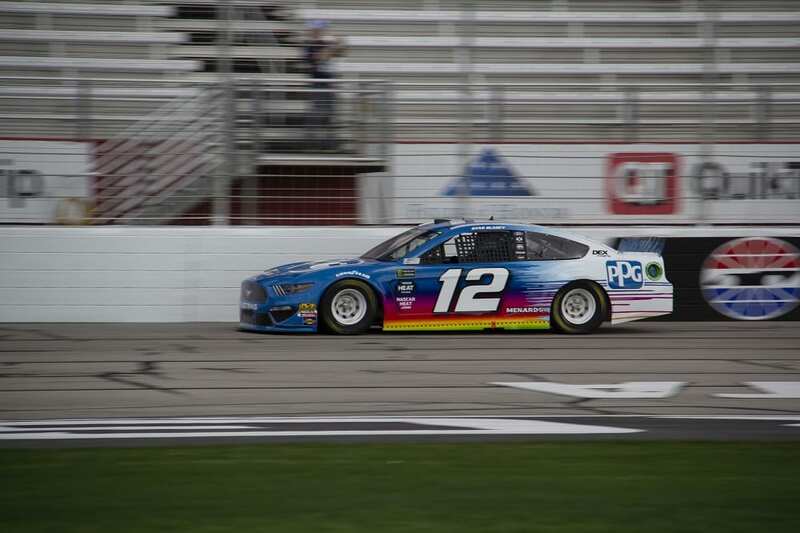 A poor pit stop by Blaney cost him the lead. As the field lined up for the restart Logano led, Kurt Busch was 2nd, Keselowski 3rd, Harvick 4th, and Truex 5th. While the leaders strung out quickly the battles for position behind them went three and four wide for 10+ laps. 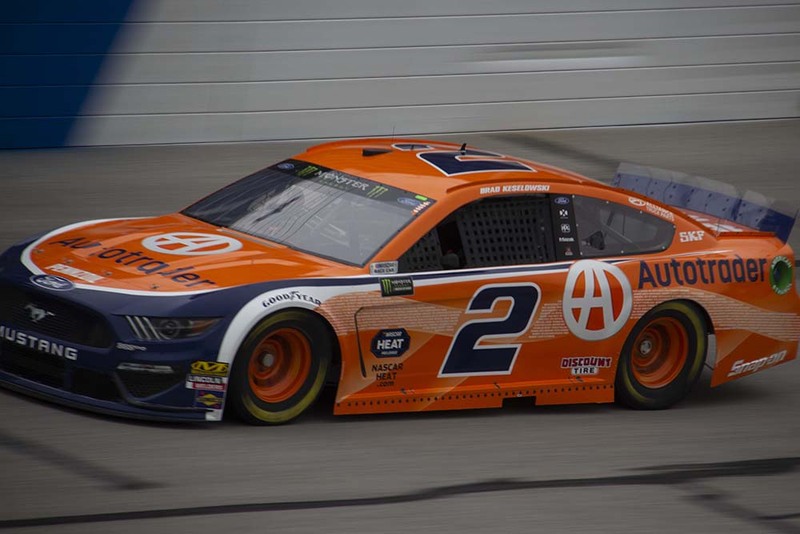 Keselowski passed his teammate Logano for the lead with 33 laps to go. Logano informed his crew he felt he had a loose wheel. Rookie Daniel Hemrick(8) passed Harvick for the 5th spot. Logano pitted with 21 laps to go to attend to his tire issue. Effectively eliminating him from contention. Hemric lost a right front tire and pitted with 16 to go, Ryan Blaney pitted with 12 to go for a tire vibration. Both falling a lap down. Remarkably, Keselowski held on for the win, despite not feeling well. Truex closed to his bumper on the final laps but could not make the pass. Winning is the best medicine. The first win for Ford Performance this year. 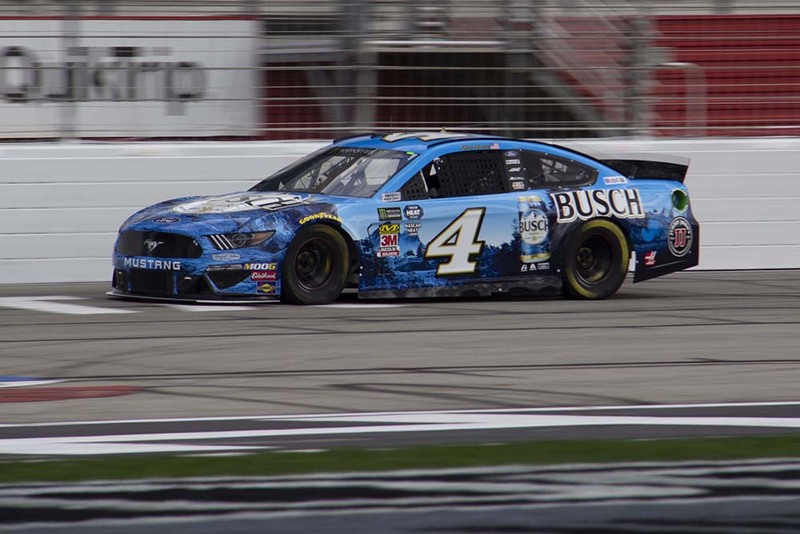 Harvick finished 4th, Bowyer 5th as Mustangs took 3 of the top 5 finishing positions and 5 of the top 10. There were 26 lead changes among 9 drivers. 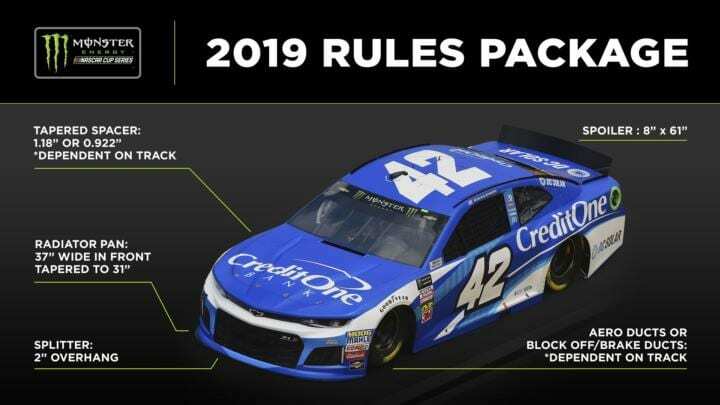 For the first run under the new rules package you have to grade it a success. Can’t wait until next week at Las Vegas. 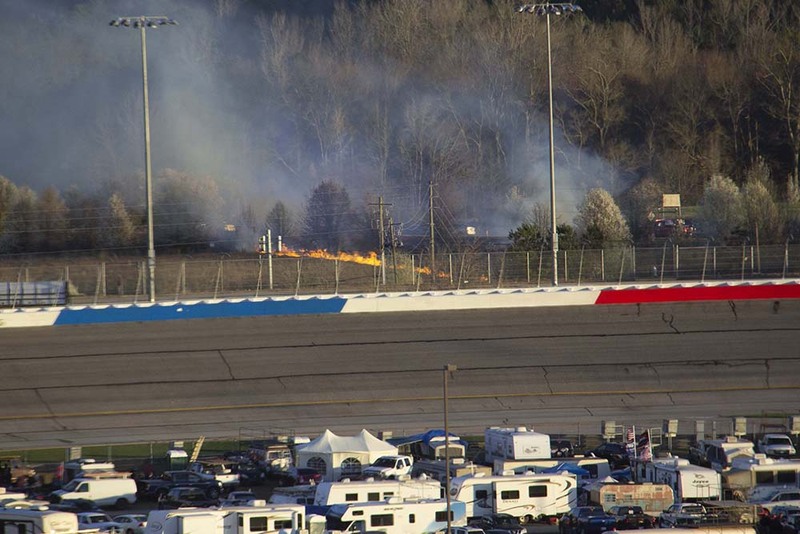 Post race fireworks set off a grass fire behind Turn 3. Fire trucks had to battle through after race traffic to get to the scene. 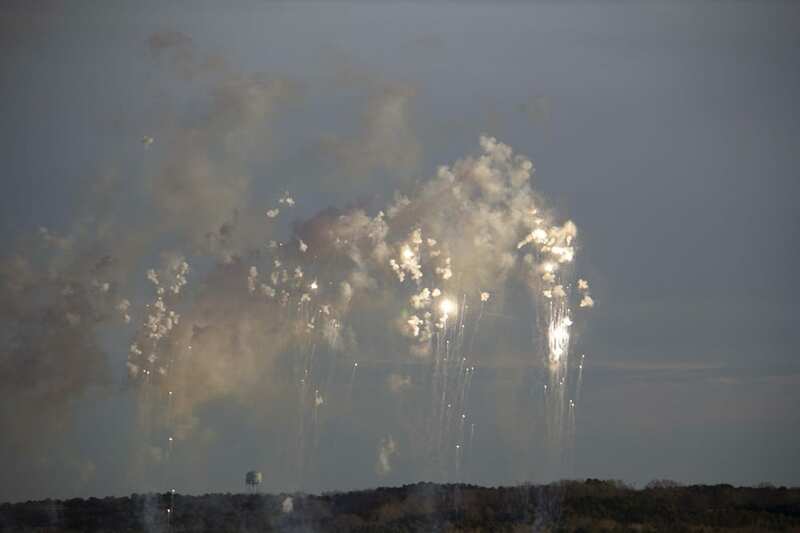 It was extinguished without further incident.